Ensuring long-term satisfaction and meeting the expectations of customers, employees and other stakeholders, achieving planned results, and improving the quality of delivered products and services are our top priorities. 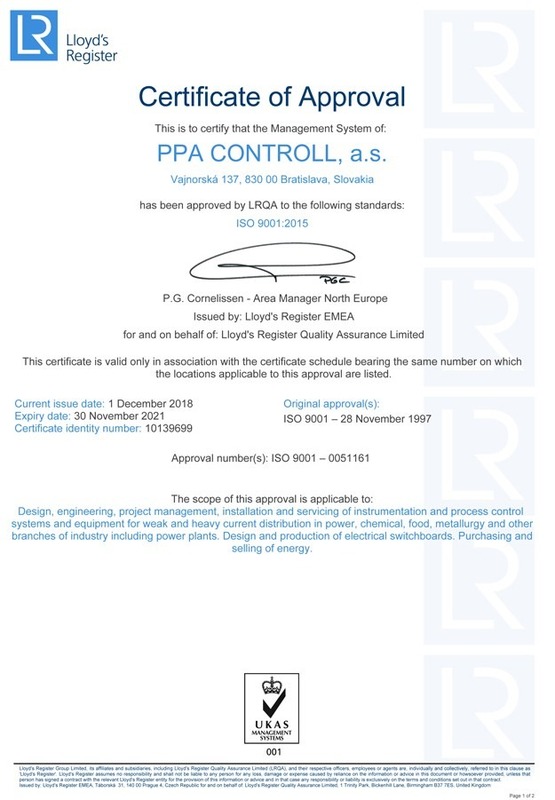 To achieve them, we are continually improving our quality management system, regularly evaluating its effectiveness, looking for opportunities, considering risks as well as internal and external factors, reducing costs and innovating products /services. 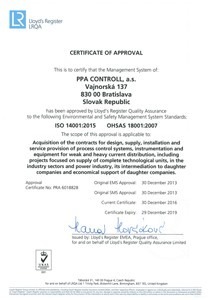 The principles of occupational safety and health and environmental protection are reflected in our company’s business activities in order to prevent possible undesirable situations causing environmental pollution, health damage and other labour and material damage. 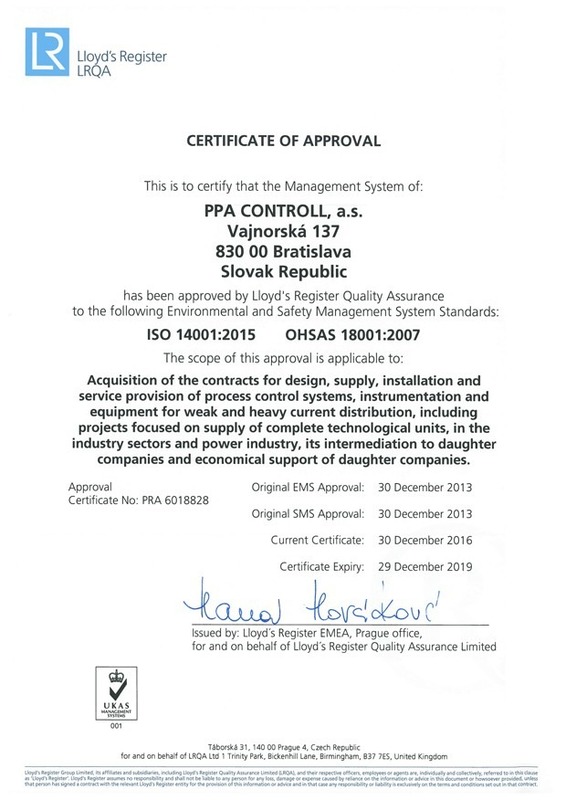 Communicating about the importance of the OSH requirements and environmental protection with employees of PPA CONTROLL, a.s. and its subsidiaries, including the suppliers’ employees, ensures their implementation and performance in the execution of the contracts. By integrating our staff’s HSE performance into everyday activities, we aim to eliminate work-related injuries and damage to health, reduce the amount of waste we generate, while increasing the share of what we recycle, minimizing the adverse impacts on the environment. 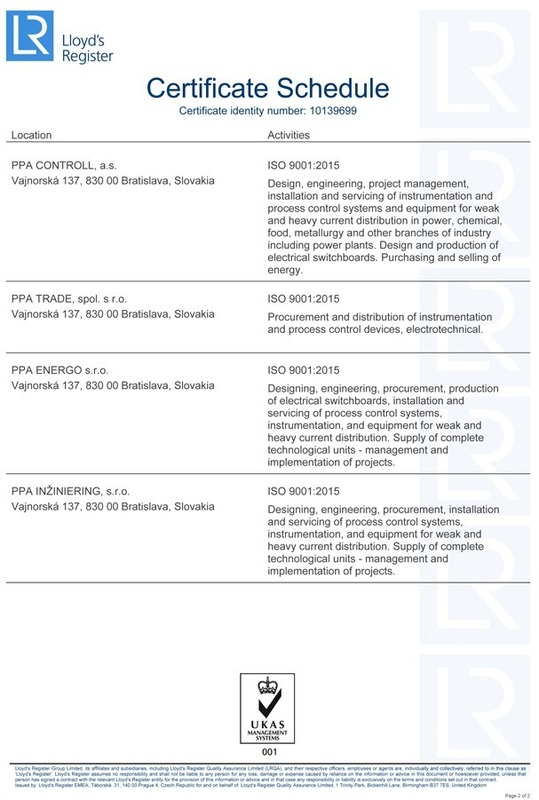 The subject of the OSH management system and the environmental management system includes the following activities: Obtaining contracts for the design, delivery, assembly and servicing of control systems of technological processes, instrumentation, both low and high current electrical installations, including projects aimed at delivering complete technological units in the industrial and energy sectors, their mediation to subsidiaries and the support of subsidiaries in the economic sphere. 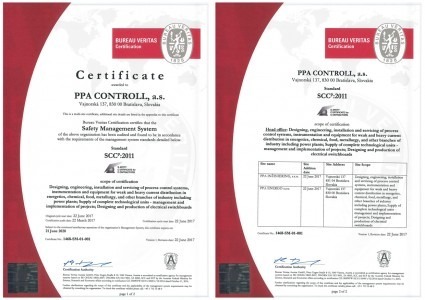 Increasingly, we have been faced with safety requirements, so our activities are also aimed at increasing the level of safety in the PPA CONTROLL Group by using the Safety Certificate for Contractors (SCC) standard. By using this new tool in the field of occupational safety and health and environmental protection, it is necessary to systematically adapt the principles of work and adapt the activities performed not only by our employees, but also by the employees of the supply companies. The applied SCC standard brings new insights into processes and working environments, raising worker awareness of environmental, safety and working (HSE) risks and behaviours, and more comprehensive satisfaction of the needs and expectations of customers and other stakeholders. 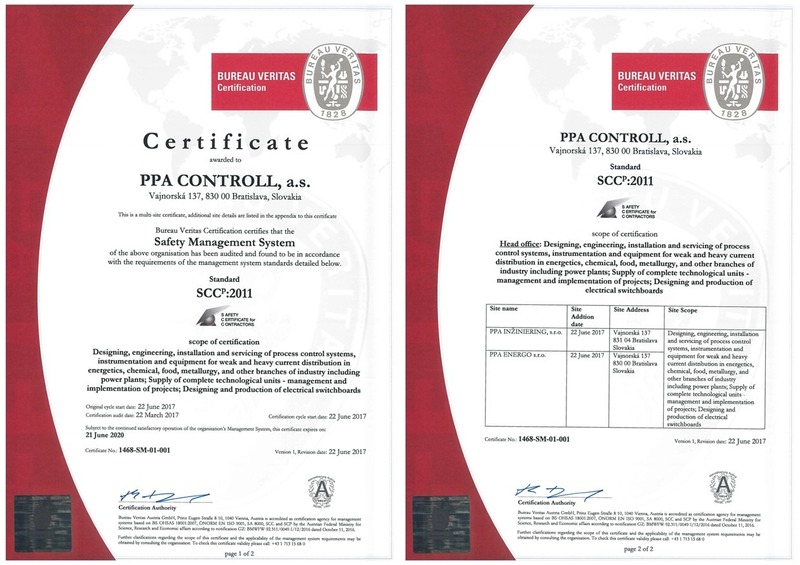 In June 2017, the implementation process was completed by certifying selected companies of the PPA CONTROLL Group according to the SCC standard.